One of the biggest problems with choosing a toilet seat is, of course, picking a seat which actually fits your toilet. With so many different types and style of fitting out there, the Anika Antique is a fine and easy choice for just about all standard fittings out there. Unless you have something pretty wacky as your choice for a toilet seat, you should be able to attach this without any real issues or struggles. 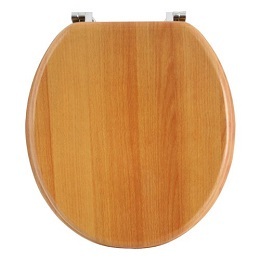 That’s probably the best part about this toilet seat – it’s simple, it’s effective and it does the job. You don’t need to worry about anything else in particular with it – it’s not got anything too special about it, but for such a low price it’s a cracking purchase and will do you proud as a reliable and long-term toilet seat. Think about it, not everybody has money to spend on classy toilet seats that are going to cost them half a weeks wages! You can pick up a cost-effective equivalent here that looks classy and is going to be durable for the long-term. If you want to pick up a solid toilet seat and you are on a little bit of a budget, this is the one for you.